Spring Roll Pastry Machine and Equipment - ANKO High Efficiency Spring Roll Pastry Production Equipment Design | ANKO FOOD MACHINE CO., LTD.
ANKO's SRP Series are Spring Roll and Samosa Pastry Sheet Machines that are capable of producing various thin pastries, such as spring roll pastry, samosa pastry and even crepes. The machines only require initial manual premixed batter loading in the hoppers/tanks, then it will automatically distribute batter evenly onto the conveyer belt to bake. After the pastry is baked, it will then be cut into uniform pieces, stacked up into piles with the programmed number of sheets, and ready for packing, freezing and/or distribution. The thickness of the pastries is at adjustable range from 0.4-0.8 mm, and the maximum width is up to 420 mm, but special sizes can be customized. 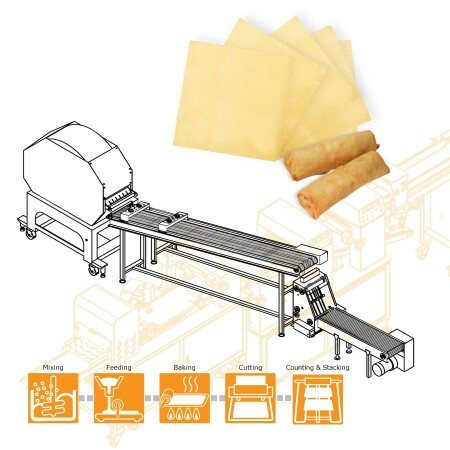 The SRP Series come in different models, starting from SRP-20, to SRP-45 and SRP-90, featuring efficiency and productivity from 1,200 pcs of spring roll pastry per hour up to 5,400 pcs/hr. Spring roll was literal translated from the Chinese term chūn juǎn（春捲）, which refers to a wide range of rolled appetizers or dim sum in East Asian and Southeast Asian cuisine. Many believe that the origin of spring rolls started as seasonal food consumed during the vernal festivals, people would fill in an abundant seasonal fresh vegetables in a piece of thin pancake, consume it during the celebration to welcome the refreshing change from winter preserved foods. Nowadays, spring rolls are found all across world, especially in the Asian eateries and food stands. Many spring rolls are made with thin flour pancakes filled with raw or cooked vegetables, others may wrap in shrimps, pieces of pork, vermicelli and herbs in rice paper, and serve it with dipping sauces. There are also deep-fried spring rolls and the look-alike egg rolls that are amongst the most popular Chinese food items in the American Chinese restaurants. The machines listed below are designed for making Spring Roll Pastry. Please feel free to contact us via the form below. We will happy to answer any questions you may have regarding our products, services, and turnkey projects.